Gauḍapāda (c.6th century CE), also referred as Gauḍapādacharya, was an early medieval era scholar of the Vedanta school of Hindu philosophy. While details of his biography are uncertain, his ideas inspired others such as Adi Shankara who called him a Paramaguru (highest teacher). Gaudapada was the author or compiler of the Māṇḍukya Kārikā, also known as Gaudapada Karika. The text consists of four chapters (also called four books), of which Chapter Four uses Buddhist terminology thereby showing it was influenced by Buddhism. However, doctrinally Gaudapada's work is Vedantin, and not Buddhist. The first three chapters of the Gaudapada's text has been influential to the Advaita Vedanta tradition, parts of the first chapter that include the Mandukya Upanishad have been considered a Sruti by Dvaita and Vishistadvaita sub-schools of Vedanta, but nothing from chapter four with Buddhist flavor has found acceptance or use in the Vedanta school of Hinduism. The century in which Gaudapada lived and his life details are uncertain. Estimates vary from early 6th to 7th century CE. He is generally dated from estimates for Adi Shankara, whose teacher Govinda Bhagavatpada is presumed to be the direct disciple of Gaudapada. Shankara in some texts, refers to Gaudapada as the "teacher's teacher" who knows the tradition of the Vedānta (sampradāya-vit). Assuming how long each lived and when, Gaudapada is estimated to have lived sometime in the 7th century CE. Alternatively, states Potter, the phrase "teacher's teacher" should not be taken literally, and more in the sense of another phrase he uses for Gaudapada, namely Paramaguru (highest teacher). He may have been the guru of Sankara's teacher, but was likely a more distant guru, states Michael Comans. Another estimate places him around the early 6th century. This estimate is based on Buddhist literature, and particularly those of scholars Bhavaviveka, Santaraksita and Kamalasila who cite Gauḍapada kārikās. Bhavaviveka was a contemporary of Dharmapala, states Karl Potter, while Chinese texts and travel accounts place Dharmapala in the mid 6th century CE. Assuming the Buddhist and Chinese records are reliable, and for Bhavaviveka to have quoted Gauḍapada kārikās, Gaudapada must have lived around 500 CE, or sometime in the first half of 6th century CE. But, it is certain that Gaudapada lived after the 4th century because he cites some Buddhist views of Nāgārjuna and Asanga, the latter of whom various accounts place in 4th century India. Gaudapada wrote or compiled the Māṇḍukya Kārikā, also known as the Gauḍapāda Kārikā and as the Āgama Śāstra. [note 1] Some scholars, states Karl Potter, doubt that Gaudapada Karika was written by one author. The Māṇḍukya Kārikā is a concise explanation, in verse form,[note 2] of the doctrines in Mandukya Upanishad, one of the shortest but a profound Upanishad, consisting of just 12 sentences. Even before the time of Adi Shankara, Mandukya Upanishad was considered to be a Śruti, but not one particularly important during his era. In later periods it acquired a higher value, and expressing the Upanishadic essence. The Māṇḍukya Kārikā is the earliest extant systematic treatise on Advaita Vedānta, though it is not the oldest work to present Advaita views, nor the only pre-Sankara work with the same type of teachings. According to Hajime Nakamura, not only was the Gaudapada Karika treasured in the Advaita tradition, the text was revered and highly respected in Vishistadvaita and Dvaita Vedanta schools of Hinduism as well. Gaudapada's text, adds Nakamura, was treasured but not considered a Sruti by Advaita scholars, while Ramanuja and Madhvacharya of non-Advaita schools considered its first chapter to be a Sruti. Chronologically, according to Hajime Nakamura, the Buddhist texts that quote from Gaudapada Karikas imply that the Vedantic ideas in the first three chapters are of greater antiquity. Most of Chapter Three of the compilation of Gaudapada Karika was complete by 400–500 CE, states Nakamura. He estimates that most of Chapter One was complete by 300–400 CE, while Chapter Two which presupposes Chapter One can be dated to have been mostly complete after Chapter One but before Chapter Three. Most of the Chapter Four was written sometime between 400 and 600 CE. The Self resides in one's body in three forms: waking state, sleeping dreamy state and in deep sleep state, according to Potter's translation. When awake, the Self experiences the Vishva – the external objects and the visible; when dreaming, it experiences the Taijasa – the internal mind objects and what appears in the dreams; when in deep sleep, the Self experiences Prajna – the unpolarized, the fruits of the heart and bliss. The description of these states of self are similar, states Arvind Sharma, to those found in Brihadaranyaka Upanishad and other ancient Hindu texts. Gaudapada presents the competing traditional theories about life in vogue, before and in his times, in Karika 6 through 9. Some claim creation is the result of the expansion of the Self, some claim it is a mere magic show, some claim the creation is from God's desire, some claim Kala (time) creates all beings. In Karika 10, the text states there is a fourth state of the Self, called Turiya, one of Advaita (nonduality), all pervading, unchanging and without Dukkha (sorrow). This fourth state of Self in Gaudapada Karika is found in chapters 8.7 through 8.12 of Chandogya Upanishad, which discusses the "four states of consciousness" as awake, dream-filled sleep, deep sleep, and beyond deep sleep. The Vishva and Taijasa state of Self – states Gaudapada – can be a source of cause and effect, the Prajna is only cause, while Turiya state is neither. 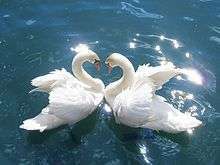 It is the waking state and dream state that lead to awareness, errors and unawareness. The perceived duality of the world is Maya, when in reality there is only nonduality. 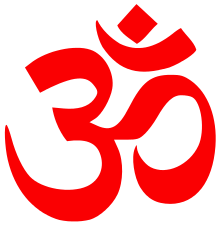 Chapter One ends with the discussion of the Om and its symbolism for Brahman, and the Atman within the heart of all living beings. Unreal are the dream objects during sleep, states Gaudapada, because the one who dreams never actually goes to place he dreams of, and because whatever situation he dreams about is something he leaves upon waking up. This is in the scripture Brihadaranyaka Upanishad. In the same sense, the true reality is covered up for man even in his waking state, state Karikas 4-6 of Chapter Two, because, translates Potter, "any object nonexistent in the beginning and in the end is also nonexistent in the middle". When we sleep, we feel the external things we dream about are real and the internal states as unreal, but in the awakened state we realize both are unreal. In the same way, in our waking state whatever we apprehend to be real and unreal are both unreal, covering up the true reality, state Karikas 10-15. But this assertion leads to the obvious question, states Gaudapada, that if both internal and external are not true reality, who is it that imagines, who apprehends them and who cognizes? Gaudapada submits his answer as the Atman (Self, soul). Gaudapada Karika states that while we do grasp objects, we perceive, we think, but this does not connote the nature of reality and unreality, just like our fear of "a rope for a serpent in darkness". We construct realities, states Gaudapada, and imagine Jivatman to be various things such as prana (brreath), loka (world), deva (gods), bhoktr (enjoyer), bhojya (enjoyables), sukshma (subtle), sthula (gross), murta (material), amurta (nonmaterial) and so on. We imagine things in our mind, we create things in our mind, we destroy things in our mind, says Gaudapada; yet all these things are not different from It, the Atman (gender neutral). All such constructions create dualities in our imagination, are Maya. The true reality, state Karikas 33-36, is nondual and it is Atman. Those who have mastered and grown past all attachments, past all fear and past all anger, they are past all dualities, know their Self, have secured the nonduality within. According to Karika 36-38, such wise individuals, do not care about praise from anyone, are beyond all rituals, are homeless wanderers, for they have realized the true inside them and outside; they, translates Potter, "remain steadfastly true to nature". and who are thus miserable. Gaudapada opens this chapter by criticizing devotional worship of any form, and states that this assumes that the Brahman-Atman is born. He states that the nondual Brahman-Atman (Self) can give rise to apparent duality (Jivas, individual souls), while remaining unaffected in the process. To this end he gives the analogy of space and jars. Self is like space and the Jivas are like space in jars. Just as space is enclosed in a jar, so is the Self manifested as Jivas. When the jar is destroyed the space in the jar merges into space so likewise, are the Jivas one of the Self. Gaudapada states that the Upanishads such as the Brihadaranyaka Upanishad teach this, that one's own Atman (self) is identical to the Atman in other beings, and all Atman are identical with the Brahman. While some Upanishads, acknowledges Gaudapada, imply a difference between individual soul and the Brahman, those texts are discussing the apparent distinction (duality) when one believes in apparent creation. In reality, states Gaudapada, there is no creation of souls from Brahman as they are identical. We must not confuse passages meant for spiritual instruction. According to Karikas 3.17-18, Gaudapada admits that dualists disagree with this view, but the ancient texts admit duality in the context of appearances, while "nonduality is indeed the highest reality", translates Karmarkar. The last chapter of Gaudapada Karika has a different style than the first three, and it opens by expressing reverence for all "the greatest of men", who are like the cosmic space through their awareness of nonduality, free from self-contradictions and confusion, and who understand Dharma. Karikas 3–10 repeat some content from previous chapters, but with some word substitutions. Karikas 11–13 quote the key duality premise of Samkhya school of Hindu philosophy, cross examines it, then asks how and why is cause eternal? The text states that the Samkhya premise "cause is born as its effect" leads to infinite regress, which is not persuasive. Gaudapada Karika then acknowledges the theory of Ajativada or non-origination of the Buddhas (Buddhists). Like Samkhya premise, the text praises and cross examines it, in three ways: first, non-origination premises makes sense when neither the point of origin nor the end of something is known, but we know the point of origin of any example of something produced and there Ajativada premise does not follow; secondly, the Ajativada premise commits the Sadhyasama fallacy of reasoning by offering examples of what is yet to be proved. Thirdly, state Karikas 29–41, neither samsara nor mukti has a beginning or end, because if something is born it must have an end, and something that is unborn has no end. Karikas 45–52 state that only (Vijnana) consciousness is real, explaining it with an example of fire stick before and during the time it burns, and adding we construct and deconstruct our state of awareness. Karikas 53–56 assert that there is no causation, no effects, and repeats that consciousness is the only one real thing. Everything is impermanent, nothing is eternal and everything is also without origination by nature, state Karikas 57–60. Karikas 61–81 repeat text on four states from earlier chapters to re-emphasize the premises about impermanence and non-origination. Attachment to unreality causes desire, sorrow (Dukkha) and fear, while detachment leads to freeing from such states and to samadhi. There are three stages of understanding state Karikas 87–89: Laukika (ordinary. which cognizes object and subject as real), Shuddha laukika (purified ordinary, perceiving is considered real but not the objects) and Lokottara (supramundane, where neither objects nor perceiving are cognized as real). Karikas 90–100 presents Agrayana (vehicle) to knowing. The text states, "all dharmas are without beginning, without variety, and are consciousness only". Duality is for the unwise, nonduality and undifferentiated Reality is for the wise and difficult to grasp. The last Karikas of the Chapter Four add, translates Karl Potter, "this the Buddhas understand, the Buddha instructs us that consciousness does not reach the dharmas, yet the Buddha said nothing about either consciousness or dharmas!" The influence of Buddhist doctrines on Gaudapada has been a vexed question. We have been talking of borrowing, influence and relationship in rather general terms. It is necessary to define the possible nature of the borrowing, granting that it did take place. (...) The Vedantins stake everything on the Atman (Brahman) and accept the authority of the Upanishads. We have pointed out at length the Nairatmya standpoint of Buddhism and its total opposition to the Atman (soul, substance, the permanent and universal) in any form. Advaitins particularly have traditionally challenged the Buddhist influence thesis. Modern scholarship generally accepts that Gaudapada was influenced by Buddhism, at least in terms of using Buddhist terminology to explain his ideas, but adds that Gaudapada was a Vedantin and not a Buddhist. Gaudapada is also credited with a commentary on Samkhyakarikas. According to Potter, the naive nature of this commentary is in sharp contrast to the depth of reflection in Gaudapada Karikas, and the commentary on Samkhyakarikas is unlikely to be one by Gaudapada. Gaudapada is one of the key persons in the Advaita Vedanta. He is traditionally said to have been highly influential on Adi Shankara, one of the most important figures in Vedic philosophy. Shri Gaudapadacharya Math[note 8], also known as Kavaḷē maṭha कवळे मठ, is the oldest matha of the South Indian Saraswat Brahmins. The Peetadhipathi "head monk" is Śrī Gauḍapadācārya. Rajapur Saraswat Brahmins and Smartist Goud Saraswat Brahmins are its main disciples. ↑ Karika is defined by Monier-Williams as "concise statement in verse of (esp. philosophy and grammar) doctrines" in the Indian traditions. 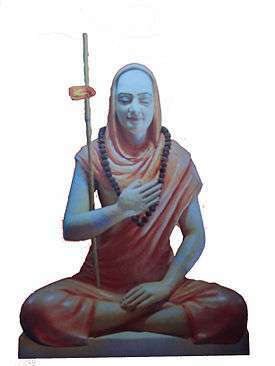 ↑ Adi Shankara interprets this Karika somewhat differently, according to Comans. ↑ 1. Something is. 2. It is not. 3. It both is and is not. 4. It neither is nor is not. The 'four-cornered negation' is an English gloss of the Sanskrit, Chatushkoti. ↑ The influence of Mahayana Buddhism on other religions and philosophies was not limited to Vedanta. Kalupahana notes that the Visuddhimagga – a Theravada Buddhist tradition, contains "some metaphysical speculations, such as those of the Sarvastivadins, the Sautrantikas, and even the Yogacarins". 1 2 3 4 Raju 1971, p. 177. 1 2 3 4 5 6 Potter 1981, p. 103. 1 2 3 4 5 6 Potter 1981, p. 105. 1 2 Sarma 2007, pp. 125-126. 1 2 3 Nakamura 2004, p. 308. ↑ Potter 1981, pp. 106-111. 1 2 Nakamura 2004, p. 311. 1 2 3 4 5 Nakamura 2004, p. 280. ↑ Michael Comans 2000, p. 163. ↑ Nakamura 2004, p. 3. ↑ Michael Comans 2000, p. 2, 163. ↑ Michael Comans 2000, pp. 45-46. 1 2 Sarma 2007, p. 126. 1 2 Nakamura 2004, p. 211. 1 2 3 4 5 6 7 8 Potter 1981, p. 106. 1 2 3 4 5 6 Potter 1981, p. 107. 1 2 3 4 5 6 7 Potter 1981, p. 108. 1 2 3 4 5 Potter 1981, p. 110. 1 2 Nakamura 2004, p. 309. ↑ Nakamura 2004, p. 310. 1 2 Arvind Sharma (2012). Sleep as a State of Consciousness in Advaita Vedanta. State University of New York Press. pp. 41–48. ISBN 978-0-7914-8430-2. ↑ Arvind Sharma (2012). Sleep as a State of Consciousness in Advaita Vedanta. State University of New York Press. pp. 43–45. ISBN 978-0-7914-8430-2. ↑ PT Raju (1985), Structural Depths of Indian Thought, State University New York Press, ISBN 978-0887061394, pages 32-33; Quote: "We can see that this story [in Chandogya Upanishad] is an anticipation of the Mandukya doctrine, (...)"
↑ Isaeva 1995, p. 30-34. 1 2 Isaeva 1995, p. 43. ↑ Isaeva 1995, pp. 44-45. 1 2 Potter 1981, pp. 108-109. 1 2 3 Potter 1981, p. 109. ↑ Michael Comans 2000, p. 166. 1 2 3 4 Potter 1981, p. 111. 1 2 Potter 1981, p. 112. ↑ Potter 1981, pp. 112-113. 1 2 3 4 5 Potter 1981, p. 113. ↑ Potter 1981, p. 114. 1 2 Michael Comans 2000, p. 2. ↑ Kochumuttom 1999, p. 1. ↑ Kochumuttom 1999, p. 5. ↑ Sarma 2007, pp. 126, 143-144. ↑ Garfield & Priest 2003. ↑ Raju 1971, p. 177-178. ↑ Kalupahana 1994, p. 206. ↑ Sarma 2007, pp. 145-147. 1 2 3 Potter 1981, p. 104. ↑ Shri Gowdapadacharya & Shri Kavale Math (A Commemoration volume). p. 10. ↑ http://www.shrikavalemath.org.in/, Title: About Kavale matha. Bhatta, Rathnakara (2013). Shree Shankarayana (May. 2013), pp. 190–380. Michael Comans (2000). The Method of Early Advaita Vedānta: A Study of Gauḍapāda, Śaṅkara, Sureśvara, and Padmapāda. Motilal Banarsidass. ISBN 978-81-208-1722-7. Isaeva, Natalia V. (1995). From Early Vedanta to Kashmir Shaivism: Gaudapada, Bhartrhari, and Abhinavagupta. State University of New York Press. ISBN 978-0-7914-2449-0. Gauḍapāda Ācārya; Śaṅkarācārya; Nikhilananda, Swami; V Subrahmanya Iyer (1990). Māṇḍūkyopaniṣad : with Gauḍapāda's Kārikā and Saṅkara's commentary. Calcutta: Advaita Ashrama. ISBN 81-7505-022-5. Dvivedi, Manilal N. (2003). The Mandukyopanishad: With Gaudapada's Karikas and the Bhashya of Sankara. Jain Publishing Company. Fox, Douglas (1993). Dispelling the Illusion. Albany: SUNY Press. Jones, Richard H. (2014). Gaudapada: Advaita Vedanta's First Philosopher. New York: Jackson Square Books. King, Richard (1995). Early Advaita Vedanta and Buddhism: The Mahayana Context of the Gaudapadiya-Karika. SUNY Press.